The bridesmaid finally caught the bouquet at the 2011 Virgin London Marathon, as Kenya's Emmanuel Mutai, who had finished second in his last three marathons, got the win in incredibly impressive fashion, running away from the field thanks to a pair of 4:30 miles for miles 21 and 22 (mile 22 was actually 4:31), enabling him to go on to set a new course record 2:04:40 (previous course record was 2:05:10) and become the 4th-fastest performer (5th-fastest performance) in human history. The win was much deserved from Mutai - whom we called the newest "Mr. Silver" in our race preview - as coming into the race, he'd had developed a history of running incredibly well in the world's best marathons but not finding a way to win. In addition to his three straight runner-ups at three of the most competitive marathons on the planet in last year's New York, last year's London and the 2009 World Championships in Berlin, Mutai had run six majors in a row and finished in the top six every time but with zero wins to his credit. Even more deserved than Mutai's win was the resurgent and surprising 2nd-place finish by three-time London and two-time New York champion Martin Lel, who was running in his first marathon since the 2008 Olympics. The injury-plagued Lel only joined the elite field as a replacement for Sammy Wanjiru at the end of March. An incredibly stacked men's elite field started the race at 9:45 AM under very good conditions, as it was largely a windless, albeit a touch warm (race temperatures have been reported to have gone from 59 to 65 degrees Fahrenheit) day that greeted the competitors. A strong pace was set from the very get-go. 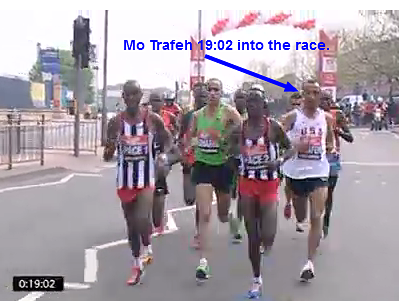 A lead pack of twelve that included two pacemakers, as well as American marathon debutant Mo Trafeh, went through 10k in 29:24 (2:04:03 marathon pace, although it should be pointed out that the course loses more than 100 feet in elevation during the first 10k). A little after 15k, Trafeh was dropped by the lead group, as a pack of 11 (including the two pacesetters) went through 20k in 59:29 (30:05 2nd 10k) and halfway in 62:44-45. At 30k (1:29:21 - 29:52 3rd 10k), when the last pacemaker called it a day, the lead pack of nine was all together and everyone was on 2:05:40 pace. Jaouad Gharib - 2003 & 2005 World champ, 2008 Olympic silver medallist. With so many studs so close together, it seemed that a battle to the tape was likely in store. Instead, the race for all practical purposes would soon be over, as after Kebede initially accelerated to get the lead group down to six, Mutai threw down a 4:30 21st mile that gave him a big lead. He followed that up with a 4:31 22nd mile, which was more than enough to break everyone in the field's spirits, as the two men that tried to come with Mutai - world-ranked #1 Patrick Makau and three-time champ Martin Lel - were soon left to battle it out for 2nd. After the 22nd mile, it was a race against the clock for Mutai, and soon it was easy to see why. The Greatest 10km Stretch Ever Run In A Marathon? Mutai steamed past the 40 km in 1:58:05, meaning he covered the fourth 10k of the course in a ridiculous 28:44 - that's 2:01:14 marathon pace for that stretch - unofficially the greatest fourth 10km stretch ever run in the history of the marathon. For comparison's sake, realize when Haile Gebrselassie set his world record of 2:03:59, he covered the 30 km to 40 km stretch in 29:09. Mutai was some 25 seconds better. Mutai barely slowed over the final 2.2 km, as he was on 2:04:34 pace at 40k and finished in 2:04:40 to get his first London and World Major Marathon (WMM) win in his fourth try in London and seventh WMM. "I so much wanted to win a major marathon and this time I did it," Mutai said to race organizers after the race. "Now I can say I am a great marathon runner because I achieved two goals at once - I won London and I ran 2:04." The battle between the resurgent Lel and Makau for second wasn't decided until the final 40 meters, as after a cat-and-mouse waiting game over most of the final straight, Lel exploded past Makau four or five seconds before the line to get a much-deserved 2nd place finish, with both clocked in 2:05:45. "I am a little bit surprised," the late addition Lel beamed after the race. "I thought I could run 2:10 and maybe finish in the top 10. I didn't think about the top two, it is way beyond what I expected." Lel's runner-up finish was heartwarming, but the day clearly belonged to Mutai, who was simply spectacular. If Mutai had had competition late in the race, he might have run the 2nd-fastest marathon of all time, as the #2 time in history is a 2:04:26 by Gebrselassie, and the #2 performer sits at 2:04:27. The 1:05 margin of victory for Mutai was the race's largest in 15 years, as in 1986, Japan's Toshihiko Seko beat Brit Hugh Jones in 1986 by 1:42. The fourth-place finisher was two-time New York winner Marilson Gomes dos Santos, who showed that he's not just made for the New York course, lowering his PR from 2:08:37 to 2:06:24, while the defending champion Kebede ended up 5th in 2:07:48. What happened to the American Trafeh, you say? Well, he paid dearly for making the classic rookie marathoner's blunder - going too fast at the beginning. He was a DNF before the 25 km mark. Trafeh wasn't the only American first-timer who went out way too fast, as Patrick Smyth also ended up as a DNF after a 63:51 1st half. The third American rookie in the race in Stephen Shay also abandoned the race after going through halfway in 66:36. The top American at the finish (almost by default, although he did run pretty well) was Jason Lehmkuhle (whose name was misspelled by the London organizers as Lehmkhule), who finished 13th in 2:13:40. Lehmkuhle, who sports a best time of 2:12:24 from last year's Boston, went out at a pace that might give him the first 2:10 or 2:11 of his career, as he hit 13.1 in 65:42. But he faded, particularly from 40k to the finish, as at 40k, he was on 2:13:03 pace. Top 25 results appear below. Video highlights at bottom.